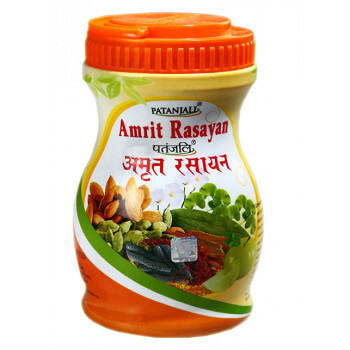 In our store You can buy Amrit Rasayana Patanjali at the best price! Amrit Rasayana - known Ayurvedic medicine that is a tonic for all organs and systems of the body. Amrit Rasayana stimulates the immune, nervous and digestive systems. It also has a beneficial effect on the cardiovascular and respiratory system. In addition, Amrit Rasayana contributes to the overall improvement and rejuvenation of the body, stimulates the elimination of toxins and nourishes the body with essential nutrients, increases the level of activity and vitality of the person. Content: Bacopa monnieri, Convulvuius Pluricaulis, Crocus sativus, Piper longum, Prunus amygdalus, zeylanichin Cinnamomum, Asparagus racemosus, Emblica officinalis, Saceharum offcinarum, Ghee , Bambusa arundinaceae, Elettaria сardamomum, Mucuna pruriens, Amla. adults: 1 teaspoon morning and evening with warm water or milk. children: 1/4 - 1/2 teaspoon twice a day with warm water or milk. Original name: Amrit rasayana Divya Pharmacy - Patanjali. In our store You can buy authentic Amrit Rasayana Patanjali at the best price!